HONG KONG, June 29, 2014 - (ACN Newswire) - Ernest Borel Holdings Limited ("Ernest Borel" or the "Group"), one of the best-selling Swiss-made premium watch brands in the PRC, today announced the details of its proposed listing on the Main Board of The Stock Exchange of Hong Kong Limited ("SEHK"). The Group intends to issue a total of 66,000,000 shares globally (subject to the exercise of the overallotment option), of which 90% are for the International Offer. The remaining 10% are for the Hong Kong Public Offer. The indicative offer price range is between HK$2.54 and HK$3.46. Net proceeds from the global offering are estimated to be approximately HK$137.2 million to HK$196.1 million. The Hong Kong Public Offer will begin on 30 June 2014 (Monday) and end at noon on 4 July 2014 (Friday). The final offer price and allotment results are expected to be announced on 10 July 2014 (Thursday). Trading of Ernest Borel's shares is expected to commence on the Main Board of SEHK on 11 July 2014 (Friday) under the stock code 1856. The shares will be traded in board lots of 1,000 shares. BOCI Asia Limited is the Sole Sponsor, Sole Global Coordinator, Sole Book Runner, and the Sole Lead Manager of the listing. Established in Switzerland in 1856, Ernest Borel signifies the enduring spirit of elegance and romance through its brand image of a "dancing couple." The brand has become a leader in the Swiss-made premium couple watch market and an attractive global brand with its clear market positioning. The Group has also received certification from COSC, the official chronometer certification bodies, as a testament to its Swiss manufacturing quality and strict quality control. It ranked 9th, 12th and 11th among all Swiss-made watch brands in terms of number of chronometers that received COSC certification in 2011, 2012 and 2013, respectively. The Group has built an extensive distribution network which has delivered stable growth in the past years. As at 31 December 2013, the Group has more than 960 POS covering 15 countries and regions globally. The Group has also benefited from the rapid growth in the PRC, its largest market, with over 815 POS in 30 provinces and cities across the country to meet the rising demand for luxury goods driven by the increasing purchasing power in Mainland China. According to the Frost & Sullivan report, the Group has become one of the top five brands in the PRC premium watch market for three consecutive years from 2011 to 2013 in terms of total retail sales value and total retail sales volume. The Group has adopted a vertically integrated business model, providing control over the key stages of its operation chain, from product design and development, procurement of materials and components, production, logistics and quality control to promotion, distribution and after-sales services. This has helped the Group maintain high operational efficiencies and stablise costs. The Group's gross profit margin exceeded 50% in each financial year during the Track Record Period, which translates into more competitive pricing of its watches. Ernest Borel's vertically integrated business model has provided greater flexibility in the production capacity throughout the watch production process while ensuring excellent product quality. Moreover, by building a more diverse distributor base, the Group can keep abreast of the preferences of consumers and directly understand their needs. The Group has promoted its brand through effective marketing strategies across various media channels, such as television, radio, magazines, newspapers and billboards as well as sponsorship of various events and engagement of celebrities as its brand ambassadors, which have driven its income and gross profit to grow at a CAGR of 11.1% and 16.0% respectively between FY2011 and FY2013. According to the unaudited financial information for the three months ended 31 March 2014, the Group's revenue amounted to approximately HK$157.2 million, up by approximately 13.0% when compared with the same period of 2013. To drive sustainable growth in the future, Ernest Borel will further expand its sales and distribution network to strengthen its global brand position. The Group plans to add 300 POS in the PRC market in the coming three years with a focus on second- and third-tier cities. At the same time, the Group plans to extend its market reach by adding a total of 100 POS in the regions outside the PRC. Ernest Borel also intends to leverage its brand recognition and effective marketing strategy to develop more new markets and increase its market share in selected countries in Europe, the Middle East and Southeast Asia. Apart from expanding its sales network, the Group will boost profitability through enhancing its product mix and pricing strategy. In addition to improving its profitability by increasing design capabilities, production capacity and sales of its high-end and medium-high-end watches, the Group will also adopt cost effective approaches to purchase watch movements and other quality watch components at competitive prices through global sourcing so as to reduce production costs. The Group will also maintain its profit margin by increasing the average retail price of our watches by 4% to 6% each year in general. The Group will continue to expand its production capacity and design and development capabilities to meet the strong demand from global consumers for premium watches. To cope with the growth, the Group plans to expand its production capacity by constructing additional production facilities on the land parcel adjacent to its existing production facility in Le Noirmont, Switzerland. Assuming the additional production facility is fully utilised, the estimated maximum production capacity in terms of the number of watches will increase to 192,696 pieces. The Group also intends to expand its watch design and development department to further enhance its capabilities. 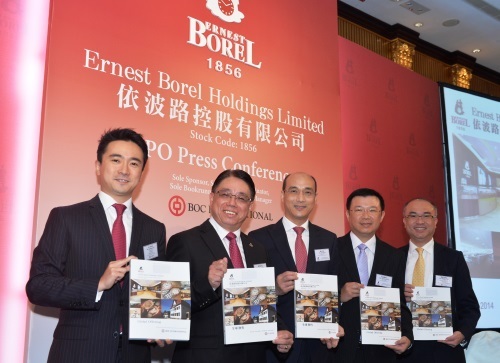 Mr. David Su, Chairman and Executive Director of Ernest Borel, said, "We are pleased to announce the proposed listing of Ernest Borel on the Main Board of SEHK, marking an important milestone in the Group's development. This initiative not only strengthens our capital base, but also enhances the Group's corporate image and brand reputation in the market as well as increases the confidence and recognition of consumers, retailers and distributors. With our distinctive competitive advantages and rich operational experience in the premium watch industry, we are ready to advance Ernest Borel's leading position in the Swiss-made premium watch market and achieve further growth, thereby generating stable and promising returns in the long run." The Group plans to pay dividends of not less than 30% of its consolidated profit attributable to shareholders in the future, subject to factors such as future operations and earnings, capital requirements and surplus, general financial condition and contractual restrictions.